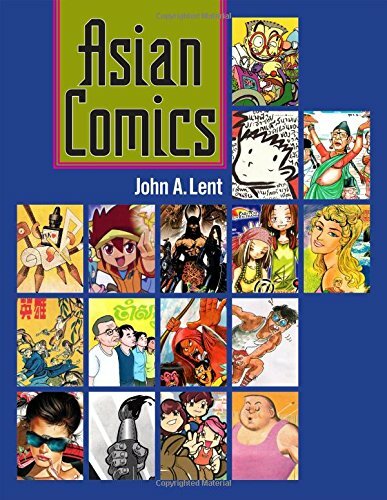 John Lent was a Professor of Communications at Temple University in Philadelphia who spent the last 30 years travelling to Asia (about 60 trips) to interview more than 400 artists, editors, publishers, critics, shop owners and even comic pirates to research on Asian comics. The end result is this oversized hardcover volume that is 342 pages. The book has 17 chapters and is divided into three sections: East Asia (China, Hong Kong, Korea, Taiwan), Southeast Asia (Cambodia, Indonesia, Malaysia, the Philippines, Singapore, Thailand and Vietnam), and South Asia (Bangladesh, India, Nepal and Sri Lanka). It does not have a chapter on Japan but Lent explains that since there are so many books on Japanese manga, there is no need for a chapter on manga. Despite this being published by a university press well known for publishing comics scholarship, the writing is very accessible. Lent’s strengths is allowing the artists to speak for themselves – ‘it is essential to discover directly from those who lived through events what they know, believe and experienced’. Each country chapters is filled with details about the comic industry like sales and distribution, and the readers get to learn about young and exciting Asian artists like Nguyen Thanh Phong (Vietnam). It is unfortunate that Asian Comics is printed in black and white. The sample artwork could not show the full diversity and colors of Asian comics. Often, readers in Asia do not know enough of our own comic history and scene. Asian Comics is indispensible as a primer, a route map into the worlds of Asian comics.